More than 20 years have passed since Sonic made its first appearance in 1991. I still remember fondly how much I enjoyed playing the first three series of the game. 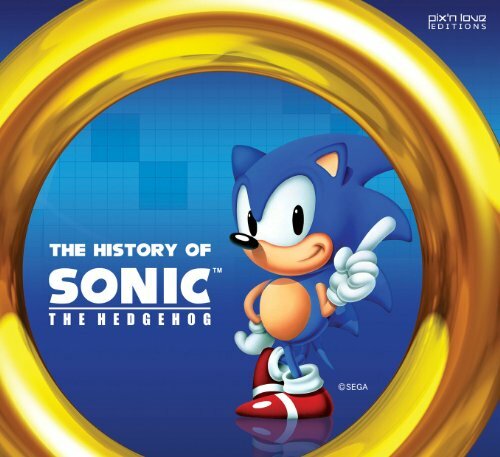 The History of Sonic Hedgehog is a befitting book that celebrates Sonic's 20th anniversary. It was originally published by Pix'N Love Editions in French and this English edition is published by Udon. It's a handsome 300-page hardcover with a nice cover. I really like the cute 2D art of Sonic on the cover as compared to the 3D version on the back cover. The book covers roughly three main parts. The first looks at the history, the second on the games and the last part on characters and extras. The history of Sonic is intermingled with the story of SEGA, before it was even known as SEGA (it was called "Service Games"). It's an interesting flashback to the creation of the Sonic through the accounts of the developers, and to the rise and fall of SEGA as a console maker, and the transformation into a multi-platform publisher. The pages are beautifully laid out with wonderful photos and screenshots. There are photos of consoles I never knew existed. Three lengthy interviews included are with the creators Yuji Naka the programmer, graphic designer Naoto Oshima and producer Takashi Iizuka of Sonic Generations (2011). The second part focuses on the games. There are eight 2D games, ten 3D games, sixteen handheld ones and 23 spin-offs over the span of two decades. I only played the first three games so I'm reading about the rest for the first time. Each game has a short but informative writeup. The screenshots are a bit small though. I wished there were more and bigger. Stage designs for the games are gorgeous. The last section has all the main characters and their profiles. The interesting bits are the Sonic cameos in other games. This book is a nostalgic trip into the history of Sonic and SEGA. Highly recommended for fans of the game.